You will hear a chick’s first cries long before you see it. 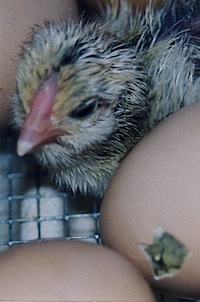 Exactly 21 days after being laid, while still tightly curled within its shell, the chick begins to voice its unhappiness. Its last reserves of food have been absorbed; its protective shell is now cramped and dry. The first peeps rise from the egg weakly, intermittently, then through the day they grow more frequent and insistent. The egg flicks ever so slightly from side to side as the bird within struggles to stretch its wings. Hours later, a crack appears, the first sign of external pipping. Then the crack becomes a breathing hole, the breathing hole becomes a window, and the window opens wide enough for a head to push through. Finally, the shell cracks in half. If all goes well — if the temperature never varies from 100 degrees, if the humidity is not less than 65 percent, if the egg is not touched or moved, if the chick’s head is positioned correctly at the large end and not at the small, if it has enough energy, and if other chicks nearby cry out enough reassurance and motivation — a wet, limp creature falls out. The entire process requires twenty-four hours, though the progress appears in idiosyncratic spurts. Each chick decides for itself if it wants to wait quietly before bursting forth in a few spectacular minutes. Or if it prefers a steady, plodding pace of birth. Some chicks, of course, do not survive the stress of emerging from their shell. It’s hard work, and no one else can help. Its mother can only sit quietly above, keeping it warm. Humans must resist the urge to peel back a tip of shell or to turn the egg, with the best of intentions, so the poor chick can see the world upright. One must not assist except in the most dire circumstances, difficult to judge when wetness and blood and destruction are natural elements of the hatching. Some hatchers are able to look away as the chick dies, insisting that if it can’t fight its way out of its own shell, it won’t be strong enough for the rigors of life ahead…. Once the summer sun has set, my mother can begin catching frogs. Standing next to her kitchen door, she pulls on thick socks and heavy-soled clogs. In one hand she grasps a flashlight, and with the other, she pulls a long, narrow, transparently blue plastic bag saved from the morning’s delivery of the Kansas City Star. Outside her home, a few hundred paces to the south, she arrives at her pond. 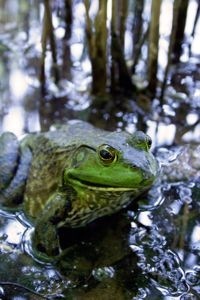 Stepping softly along its muddy banks, she listens for the deep, throaty calls of the bullfrogs. Jug-o-rum, jug-o-rum, jug-o-rum. They will continue their chorus throughout the night, filling the humid air with their reassuring vibrations and the occasional, watery plop! of surprise. To kill a frog, like the killing of any animal, is routine for those who live next to their food, though perhaps unimaginable for those who call their meat by another name. One fearless swipe of the cleaver will sever head immediately from body. Two quick nicks trim the fingers and toes down past their webbing, and a final slash along the backbone readies the skin for removal. Here, a cloth or a pair of pliers is useful: catch a firm grip on the edge of the skin and pull back toward the legs in one firm, smooth rip. Like a diver from a scuba suit, the frog’s lean, muscular body emerges pale and shimmering….